In its recently released “2018 Survey of Homebuyers Researching Lifestyle Communities,” Private Communities Registry (PCR) says that the majority of 55+ year old homebuyers are seeking “healthy, active lifestyle” as the greatest attraction in the marketplace. “Buyers are looking for experiences that contribute to the richness of their lives and to their continued wellness,” said Marie Roberts, President of Private Communities Registry (PCR). More than 3,200 respondents provided new data concerning the lifestyle and financial aspects they consider when purchasing a retirement or second home. The top three most sought-after amenities are swimming pools (77%), fitness centers (76%), and walking/biking trails (71%). With its annual survey of potential home buyers, PCR continues to uncover valuable data for home builders and developers. A market leader in researching amenity-rich, master-planned lifestyle communities, PCR provides buyers with information necessary to understand their home-purchasing options, from prices to amenities. Selections range from equestrian to golf, boating to land conservation, with property listings (homes, condominiums, lots) starting at less than $100,000 and going to more than $10 million. PCR makes its findings conveniently available on web, mobile, and tablet platforms. While 68% of respondents have never lived in a master-planned community, 88% were planning to buy within a planned environment and 77% within the next two years. 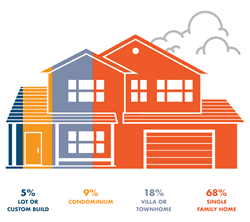 Somewhat surprisingly, 68% were seeking a single-family home versus a condominium or townhome, supporting two current trends: having enough space to gather with extended family and aging in place. “Active adult” communities were favored by respondents and 57% also want a gated community. Golf communities are third most desirable, at 30%, yet golf ranked as the number-one type of membership of interest, at 74%. Further supporting the interest in broad lifestyle opportunities, the options of social or recreational memberships were of interest to 84% of the respondents. For additional information about PCR, access the web site at http://www.privatecommunities.com. Founded in 1996, Private Communities Registry, Inc. (PCR) is the trusted online resource for real estate shoppers interested in amenity-rich, master-planned lifestyle communities. Located in Vero Beach, Florida, representatives may be reached at (772) 234-0434, toll free at (800) 875-3072, or at info(at)privatecommunities.com. For access to complete survey and results, please contact Karen Moraghan, Hunter Public Relations at 908/963-6013 or kmoraghan(at)hunter-pr.com.